The Residence Hall is a coeducational facility that provides economical and convenient housing for full time students of LSU Health Sciences Center New Orleans. The Hall is located at 1900 Perdido St., across from the LSU Health Sciences Center New Orleans Medical Education Building. 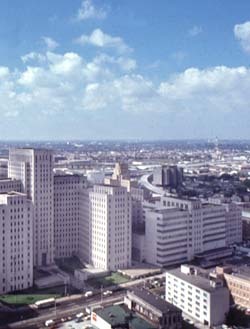 It is connected to the LSU Health Sciences Center New Orleans complex by a covered bridge located on the second floor. The Residence Hall is an eleven-story building, consisting of three separate towers with a total of 208 living units. Secured, off street parking facilities are provided for tenants and each resident is allowed one parking space. For leisure time indoor and outdoor activities, residents enjoy pocket billiards, a weight room with showers, a cardiovascular workout room, table tennis, aerobics classes and ballet classes. In addition, there is a basketball court with night lighting. For more information, visit the Residence Hall website. Stanislaus Hall is located on four floors of the recently renovated Sister Stanislaus Memorial Building, also known as the Old Charity Nursing Dormitory. This building, located at 450A South Claiborne Avenue, is on the National Register of Historic Places. Stanislaus Hall has 104 single occupancy newly furnished dorm suites. A kitchen, lounge, and laundry are on each floor. Stanislaus Hall is fireproof and air-conditioned. The building is served by two passenger elevators and one freight elevator. Security is provided 24 hours a day by the LSUHSC Police. A covered crosswalk, the LSUHSC ““Walk to Wellness,”” connects Stanislaus Hall to other building in the LSUHSC downtown complex such as the Medical Education Building, the Nursing-Allied Health Building, and the Entergy Garage where parking for LSUHSC Stanislaus Hall residents is provided. Recreational facilities are a short walk away in the Residence Hall located on Perdido Street. Facilities include table tennis and billiards, a weight room, aerobics room, dance studio, and badminton. Outside recreation at the Residence Hall includes basketball, volleyball, and badminton.